Catapult returns to Carsington Water in June for another TT weekend. We will be sailing each day with the Club fleets. The Club is in the beautiful White Peak district of Derbyshire, and has always been very welcoming to Catapult. The club website at www.carsingtonsailingclub.co.uk gives more on their facilities. Programme: There will be 5 races, and one discard will apply if all 4 or more races are sailed. The earliest start on Saturday will be at 13.15 with Race 2 back-to-back. On Sunday the earliest start will be 10.30 with Race 4 back-to-back. Race 5 will start no earlier than 13.30 on Sunday afternoon. 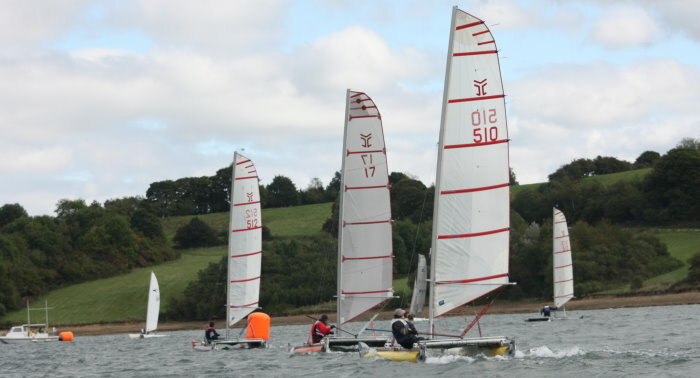 The Sailing Instructions will be posted on the club website in the near future (www.carsingtonsailingclub.co.uk). Entry costs �30 (�15 per day). The usual �5 Class Association levy will be collected on the day. Registration opens at 10.00 on the Saturday, and a briefing will be arranged late morning. Directions The Club is situated on the west side of Carsington Water, postcode DE6 1SU. The easiest approach is from the B5035 Wirksworth-Ashbourne road taking the turning signed for the Carsington Water Visitor Centre a few metres west of the Knockerdown Inn. Sailing at Carsington: There are wide shingly beaches (photo above) in the club house areas for rigging. The reservoir is big (photos below) and high up in the hills, so wind is largely unobstructed except close in to the shore and the dam. The area in front of the Club is shallow, and use of the long arms of the lake is restricted by wind direction, so the wide central sailing area can be crowded with boats in the Open events in the past. Arrival The club office will be open 10.00 to 16.00 on Friday, so it will be possible to drop off and/or assemble your boat between those hours. SPECIAL NOTE: All boats should be washed down prior to arrival to prevent contamination with killer shrimp. For more administrative matters you can contact the Club Manager, Ceri Knapgate, or the Club Administrator, Marie Thornton, on 01629 540609 or csc@carsingtonsc.co.uk. They are available from Wednesday to Sunday (10.00 to 16.00). As always we have selected Carsington not just for its great sailing but also for its location. It is in the White Peak, close to the Peak District National Park, and offers wonderful walking. Beautiful Dove Dale is just a few miles away. Stately homes abound, like Chatsworth, Haddon Hall, Market House, Kedleston Hall and Wingfield Manor.The picturesque towns of Matlock Bath (take the cable car up the Heights of Abraham) Bakewell and Buxton offer lots to do and see, and then there is the Alton Towers theme park as well. For those interested in transport there is the Peak Railway and a Tramway Museum to be visited. So Carsington could be the centrepiece of a super holiday or long weekend break.